Ever heard about the Mosque of Saleh Kamboh? 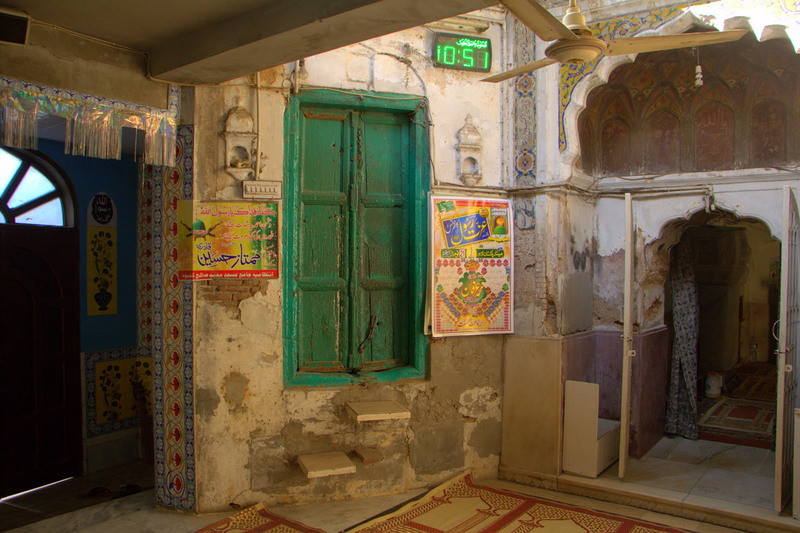 Hidden behind many publicity banners, posters and hideous hanging wires, you will come across the 450-year old Mosque of Saleh Kamboh as you traverse the passage leading to the Mochi Gate bazaar from the main circular road. Mochi Gate is one of the thirteen gates that surrounded the old city, linked with a thirty feet high fortified wall, built during the reign of Mughal Emperor Akbar. 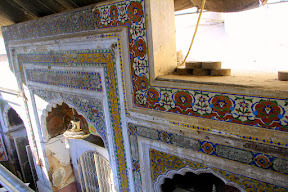 The mosque is a protected monument by the Archaeology Department of Punjab. 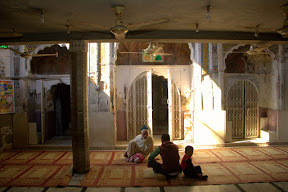 Due to negligence and laxity of the Auqaf and Archaeology Departments the mosque today is at the mercy of the locals who have taken up the task to maintain it. The local body of Anjuman-e-Tajran Mochi Gate is presently looking after it on its own and no funds are provided by the government for its upkeep. What a dishonour to the monument. 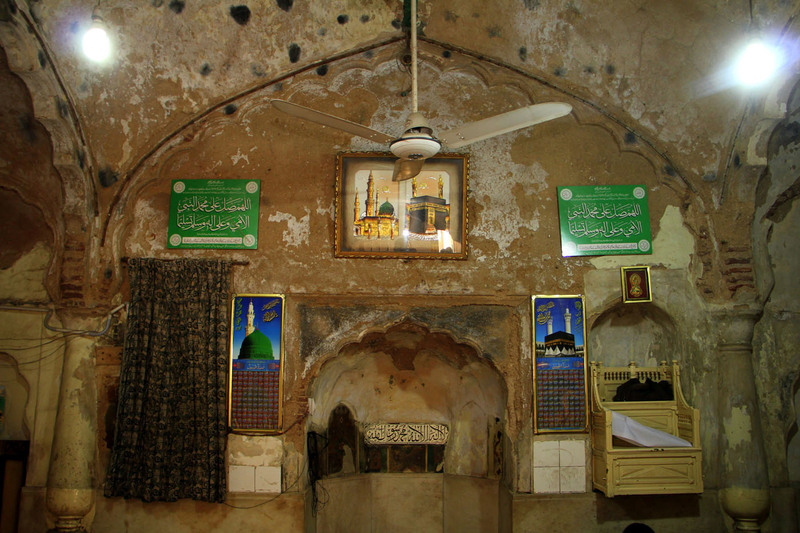 Muhammad Saleh Kamboh never knew what fate this mosque would meet after his demise. I guess many of us do not even regard it as a monument or know about it. This mosque was once among the masterpieces of the Mughal era constructions, but now it is in shambles with encroachments all around it and many modern additions and changes, which the locals have been making, to keep it intact. 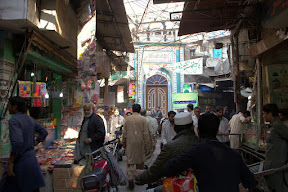 "This wonderful mosque is situated inside the Mochi Gate. Whoever enters the city through Mochi Gate finds this magnificent and colourful building straight from the Mochi Gate"
The mosque dates from 1659-1668-69 and is also known as the Chinian Wali Masjid because of the extraordinary mosaic tile work (Kashi Kari) for which the reign of Shah Jahan was famous. The mosque was completed in the period of the Mughal Emperor Aurangzeb, but the features of Shah Jahani era, like multi foil arches, delicately executed floral arabesque and interlacement in kashi and fresco, are seen in the interior of the mosque. 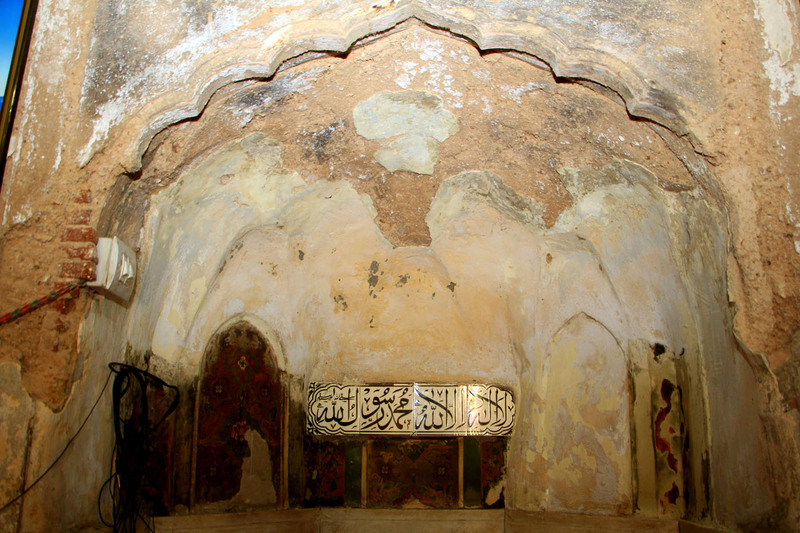 It is a smaller structure than other Mughal era mosques and is based on a single aisle three bay composition. It is approachable through steps, and is surmounted by three domes. A small door with inscriptions on it leads one inside. 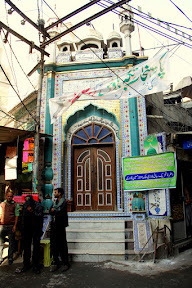 The façade has also been changed now to a modern tile structure but has clear inscriptions telling the name of the mosque. It has a colourful interior but not preserved and all the remains of the fresco will vanish if the negligence prevails. 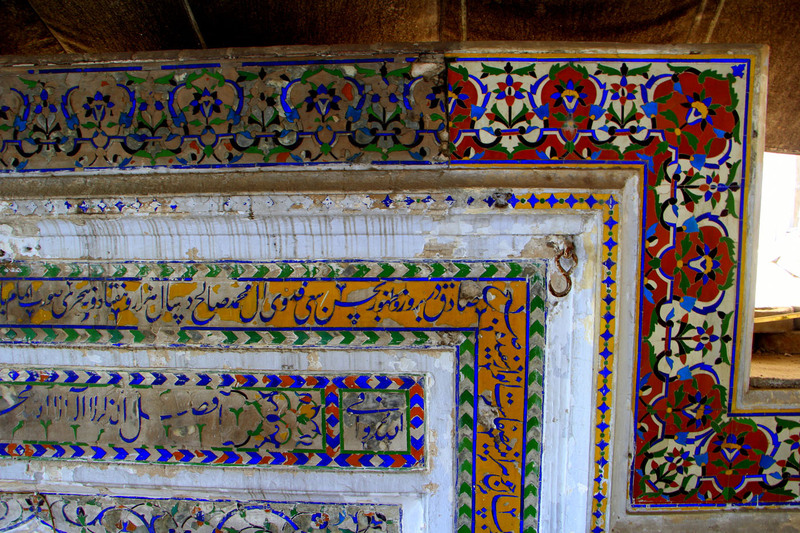 The inner chambers are as beautifully decorated as we see in the Wazir Khan or the Golden Mosque. It is stated by some historians that this mosque was as beautiful as Wazir Khan, rather more decorated, but it’s a shame that what we have done to this piece of architecture. Kanhaiyalal, the author of the ‘Tareekh-e-Lahore’ (History of Lahore), writes, “This wonderful mosque is situated inside the Mochi Gate. Whoever enters the city through Mochi Gate finds this magnificent and colourful building straight from the Mochi Gate. This small mosque was once very comprehensive and beautiful.” Saleh Kamboh had built this mosque with immense love and respect. It is we that do not keep the heritage intact. Now let’s come to who Saleh Kamboh, the man, was. He was a distinguished calligraphist and official biographer of Mughal Emperor Shah Jahan and the teacher of Mughal Emperor Aurangzeb. He was the one who recorded history during that era and compiled the Shah Jahan Nama (The History of Shah Jahan), which he completed in 1659–60 AD. He also commanded the force of five hundred during the period of Shah Jahan. 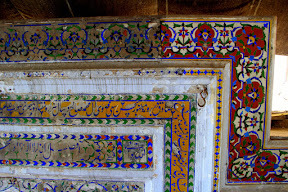 He was appointed the Deewan (Governor) of Punjab due to his sharp wisdom during Shah Jahan’s rule. It is claimed by some historic accounts that Muhammad Saleh Kamboh was killed while fighting in a battle during the tenure of Islam Khan Mashadi, the Mughal Governor of Bengal. 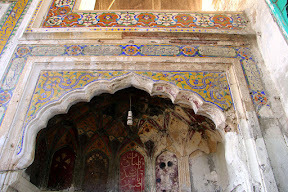 The mosque must have been a stunning piece in the past but today it is pleading for some restoration and preservation. There is no proper management, as to my knowledge. If the Walled City of Lahore Authority is looking after the affairs of the entire Walled City, it should give some attention to this monument as well before it is completely changed or damaged. This is a dilemma with most of our monuments. I being a heritage photographer feel the pain of these monuments while photographing them. I wish someone wakes up and saves these precious pieces of history. We need to preserve something for the next generations, so that they also admire and study the work of their forefathers. Photos and content by Author, "Nadeem Dar"